It is called Panigale V4 and it marks a new and important chapter in Ducati's history, a "symphony" of performance and emotions that's 100% Italian. Panigale V4 is the first mass-produced Ducati motorcycle to be equipped with a 4-cylinder engine, closely derived from the Desmosedici of the MotoGP. 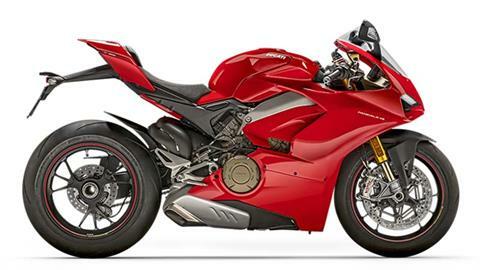 REFINED SUSPENSIONS: The new Panigale V4 is equipped with a 1.69 in. (43 mm) diameter Showa Big Piston Fork (BPF) that is fully adjustable in the compression and extension of the hydraulic brake and in the spring preload. The fork sleeve seats chromed legs to which Brembo radial brake calipers are attached. The front package is completed by the Sachs steering damper. On the back there is a fully adjustable Sachs shock absorber that on one side is attached to the Desmosedici Stradale with forged aluminum. The new Panigale V4 S and Panigale V4 Speciale are equipped with an Öhlins NIX-30 fork, Öhlins TTX36 rear shock absorber and Öhlins steering damper with event-based control system. On these versions, the suspension and the steering damper are controlled by the second-generation control system, Öhlins Smart EC 2.0, featuring, among other things, the new Objective Based Tuning Interface (OBTi). RIMS AND TIRES: While the new Panigale V4 mounts 3-spoke cast aluminium rims, the new Panigale V4 S and Panigale Speciale are equipped with 3-spoke aluminum alloy rims. Ducati and Pirelli worked closely together in the development of the new Panigale V4, the first motorcycle to use the new Pirelli DIABLO™ Supercorsa SP as original equipment, 120/70 ZR17 on the front and the revolutionary 200/60 ZR 17 on the back. The latest version of the DIABLO™ Supercorsa SP in the new 200/60 ZR 17 size, already widely used as slicks in the FIM Superbike World Championship, is in fact a generational leap in the field of racing tyre replicas. The innovative profile of the new rear size maximizes the footprint during the deepest corners and makes the most of the benefits of the dual mixture technology used, which on the shoulder uses the same SC2 compound as in racing slicks that can offer the grip typical of a racing tire while still guaranteeing the robustness and versatility needed for road use. To work in full harmony with the rear tire, even the front tyre has benefited from a major new development: all the characteristics like maneuverability, feedback to the rider, grip solidity, feeling of safety and predictability of grip loss have been optimized by creating a new front profile, with a slightly larger width than the previous version of the product. The redesigning of the shapes of the semi-finished products and the belting scheme has made it possible to set new benchmarks in terms of agility and manageability linked to racing peak performance. Finally, the new tread design of the DIABLO™ Supercorsa SP features a new "flash" geometry to optimize track performance by improving wear, and reduced groove widths designed to provide adequate support for the increased lateral thrusts. NEW BRAKING SYSTEM: The Panigale V4 range exclusively incorporates the brand new Brembo Stylema® monobloc callipers that represent the evolution of the already high performance M50 calipers. The new Stylema® calipers, machined from a single alloy block, have some lightened areas on the body and the fastening bushings that, compared to the M50, make them visibly more compact and allow a weight reduction of 0.15 lb. (.07 kg) per caliper without loss of rigidity. Other evolutionary improvements have been made on the internal ventilation for greater consistency of performance. The new Stylema® calipers offer increased hydraulic performance thanks to their extreme rigidity, guaranteeing the system's quick response, reduced brake lever stroke and maximum flexibility. The Brembo double calipers each have four 1.2 in. (30 mm) diameter pistons working on 13 in. (330 mm) diameter discs, providing outstanding braking power, while at the rear there is a 9.6 in. (245 mm) single disc with 2-piston calipers. The braking system is supported by the ABS Cornering EVO system, which uses the lightweight 9.1MP Bosch control unit. RACING TANK: The proximity of the new Panigale V4 to the racing world is underlined by the lightweight 4.2 gal (16 l) aluminum tank that, as is the case with racing bikes, has a portion of the capacity situated under the rider's seat. "DOUBLE LAYER" FAIRING: Simplicity and integration inspired the designers for the fairing with a "double layer" solution: a main outer part with a reduced longitudinal extension, and a secondary part that functions as an air extractor for the radiator. This configuration emphasizes the compactness of the mechanics and offers once again the clean lines typical of Ducati supersport bikes, which since the 916 have been distinguished by the elegance of their extended fairings. "DIAMOND" TANK: The plasticity of the ""diamond"" tank, a Ducati trademark, assists the rider at all stages of track driving. Thanks to its muscular shape it is possible to lean completely into the most extreme corners, lower the helmet for maximum aerodynamic efficiency in the straights and offer a strong lateral grip on the knees when braking deep into corners. It extends under the seat to lower the center of gravity, thus leaving a portion of the subtail visible. SLEEK TAIL GUARD: The tail guard of the single-seater version is all one piece, to emphasize the "ready-to-race" character of the bike. Its wing design is inspired by an aerodynamic spoiler and incorporates a full-LED tail light functionally divided into two parts, according to the tradition of Ducati sportbikes. The double red arch of the parking light makes the Panigale V4 unmistakable, just like its aggressive look. BOSCH EVO ABS CORNERING: The Bosch ABS system, equipped with ""Cornering"" functionality that engages the ABS even when the bike is leaning into a curve, has evolved extensively with the introduction of new intervention logic and control types. Bosch EVO ABS Cornering can be set to three different levels to fully meet track and road driving needs, even in the most critical low-grip situations. While level 3 is indicated for the road or for low-grip conditions, thereby ensuring safer and more stable braking, levels 2 and 1, which give priority to braking power, are more appropriate for racing on high-grip surfaces and racetracks. Level 2 selection makes it possible to safely slide into curves for better performance in sports riding. Level 1 of the ABS, recommended for use on the track, engages ABS only on the front brake, but maintains the ""Cornering"" feature that allows braking deep in the corners and to recover from any riding errors. DUCATI TRACTION CONTROL EVO (DTC EVO): The DTC EVO on the new Panigale V4 is based on an algorithm that makes its interventions more precise and quick. The DTC EVO interfaces with the Bosch Inertial Measurement Unit (IMU) by constantly measuring the bike's angle and using this information to better judge the actions necessary to ensure ideal slipping of the rear tire (depending on the DTC EVO level set). Additionally, the DTC EVO provides for the intervention of throttle body valves as well as the management of advance firing and injection. In all situations where a rapid intervention of DTC EVO is not required, the use of throttle body valves makes it possible to maintain optimal combustion parameters, resulting in a more fluid intervention and response of the Desmosedici Stradale. With simple traction control, when slipping of the rear tire is detected the system will intervene to control it. When the grip returns to optimal levels, the system reduces its engagement until the slipping occurs again. And the cycle repeats. This translates into a chart in which the intervention oscillates around a theoretical ""line of ideal intervention"" that represents the traction limit. The DTC EVO reduces the magnitude of these oscillations by orienting the system to engage near the perfect line of intervention. This kind of behavior is particularly advantageous as it interferes minimally with the dynamic balance of the motorcycle. Furthermore, the system is designed to be more robust and consistent, making it possible to maintain a constant and predictable behavior even when the grip changes, as in the case of rear tire wear. In addition to the greater precision of intervention, when set to level ""1"" or ""2"", the DTC EVO adds a new function called ""spin on demand"" that allows the rider to control the bike at a level previously only achievable by expert or professional riders. Now, when the bike is cornering, the rider can use the throttle to request slippage that is greater than what is achieved with the normal level of intervention so that the motorcycle, pivoting on the front wheel, can over steer the curve. The DTC EVO makes this possible while keeping the safety parameters under control, making it possible to over steer with the rear wheel. DUCATI SLIDE CONTROL (DSC): The introduction of the 6D IMU has made it possible to add Ducati Slide Control (DSC) to Ducati Traction Control EVO (DTC EVO), developed in collaboration with Ducati Corse. This system supports the rider by controlling the torque delivered by the Desmosedici Stradale engine based on the slide angle. Its objective is to improve performance coming out of the corner by preventing slide angles that could otherwise be difficult to handle. The DSC works thanks to the 6D IMU that provides the vehicle dynamics control unit with information on the motorcycle's dynamics (such as lean angle, acceleration and much more). Thanks to these data and depending on the level selected by the user, DSC extends the use of the bike to all by providing improved assistance in extreme riding conditions. Like the DTC EVO, the DSC manages torque reductions by adjusting the opening of the throttle, reducing the advance firing and dropping injection rates. In all situations where a rapid intervention of DSC is not required, the use of throttle body valves makes it possible to maintain optimal combustion parameters, resulting in a more fluid intervention and response of the Desmosedici Stradale. The DSC has two levels: moving from level 1 to level 2, the system makes it possible to more easily control the values of sliding angles that are otherwise difficult to manage. It is possible to change the DSC intervention level by entering the menu, where it is also possible to set DTC EVO and DWC EVO values. It is also possible to set the direct control of the DSC using the direct access keys on the left-hand switch. The DSC's value is always visible on the instrument panel. DUCATI QUICK SHIFT UP/DOWN (DQS EVO): The DQS EVO with up/down function, fine tuned for the Panigale V4, compared to the previous 1299 system Panigale uses the lean angle information to maximize the motorcycle's stability during shift changes in corners. Besides minimizing shift times, the DQS EVO allows downshifts without using the clutch thereby ensuring even more effective braking into corners. The system consists of a bi-directional microswitch integrated into the lever linkage that, with every change of gear, sends a signal to the Desmosedici Stradale control unit. The system acts in a different way for upshifts and downshifts, supplementing the advance firing and injection action during upshifts with the controlled opening of the throttle for downshifts, thanks to the full Ride-by-Wire system. The magnitude and duration of the various actions are designed to ensure maximum fluidity in the engagement even during extreme racing conditions, during downshifts working together with the slipper clutch and Engine Brake Control (EBC). V4 90°: For Ducati, the V4 layout at 90° is the utmost expression of sportiness for a motorcycle engine. It is no coincidence that it is the same solution used in the MotoGP Desmosedici engines. The 90° V layout of the cylinders creates a natural balancing of first-order forces without the need to resort to a balance shaft to eliminate the vibrations that notoriously entail increases in weight and power absorption. 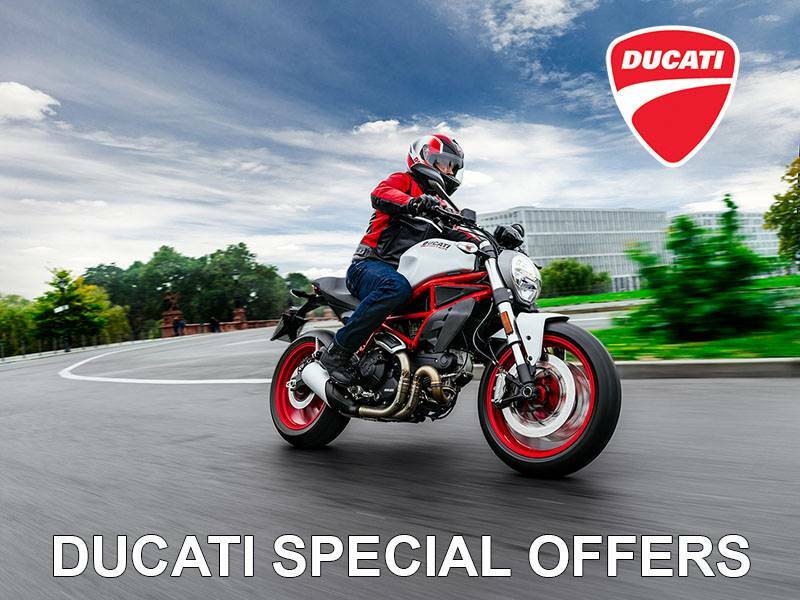 In addition to this primary benefit, which is extremely important for the reliability and mechanical efficiency of an engine that reaches rotation speeds greater than 14,000 rpm, there are others that make the configuration chosen by Ducati the most technically refined. COUNTER-ROTATING CRANKSHAFT: On street bikes the crankshaft rotates in the same direction as the wheels. In contrast, in MotoGP the counter-rotating crankshaft that rotates in the opposite direction is commonly used. The Desmosedici Stradale borrowed this technical solution from MotoGP. This innovative solution makes it possible to compensate for part of the gyroscopic effect produced by the wheels, making the bike more agile and precise when changing directions. The counter-rotating crankshaft also generates a torque due to inertia that tends to lower the front end during acceleration, and the rear end when braking, thus reducing the wheelie phenomenon. "TWIN PULSE" FIRING ORDER: The crank pins, offset by 70° like on the Desmosedici GP, require a "Twin Pulse" firing order to generate power that is easy to handle and optimise traction when coming out of curves ("Big Bang" effect). Thanks to this firing order the Desmosedici Stradale makes a unique and distinctive sound. DESMODROMIC SYSTEM: On the Desmosedici Stradale the design of the desmodromic system is a key factor for obtaining top performance. The Desmodromic system in the Desmosedici Stradale uses components that have been completely redesigned and miniaturized to obtain very compact heads, achieving a level of sophistication, compactness and lightness never seen before on a Ducati bike. Each component of the system was designed and tested to safely reach the rotation speeds the V4 is capable of achieving. Also contributing to the compact engine heads are the new spark plugs, smaller than the standard model currently in production. The four camshafts of the Desmosedici Stradale engine move the 16 steel valves, the intake valves having a diameter of 1.34 in. (34 mm) and the exhaust valves measuring 1.08 in. (27.5 mm) in diameter, quite large in relation to the 3.19 in. (81 mm) bore adopted. The valve seats are made of sintered steel. Given the V4's high rotation speeds and the large size of the valves, the latter could not follow the cam closure profiles using a traditional spring system. This is why the Desmodromic system becomes indispensable. In Ducati's ""Desmo"" the valves are mechanically closed with an accuracy similar to that of the opening phase, making it possible to realize more pronounced cam profiles and extreme timing that optimize the dynamic flow of fluids both during intake and exhaust and therefore greater performance of the engine. The camshafts are controlled by two “silent” timing chains. On the front timing system the chain drives the intake camshaft, which in turn transmits motion to the exhaust via a pair of gear wheels (mixed chain-gear timing system). On the rear timing system, on the other hand, the chain drives the exhaust shaft which transmits motion to the intake line. This choice minimizes timing absorption, benefiting performance and reliability. The chain that controls the timing of the front cylinders is positioned on the right side of the engine and is driven by the crankshaft through a gear on the sprocket of the primary transmission. The one that drives the rear cylinders is situated on the left side of the engine and is driven by a gear that is part of the crankshaft. Each head has an ""anti-beat"" sensor that makes it possible to optimize the management of advance firing, avoiding knocking phenomena. Front - 3-spokes forged aluminum alloy 3.5 x 17 in. Rear - 3 spoke forged aluminum alloy 6 x 17 in.